On the night of 16 December 1910 a group of Latvian revolutionaries attempted to rob a jeweller’s shop at 119 Houdsditch in the City of London. Their aim was to obtain funds to support revolutionary activity in Russia (and to support themselves), but their efforts to break in were overheard and nine policemen were called to the scene. The Latvians were armed; the policemen were not, and in the ensuing confrontation three of the police were shot dead and two injured. The public was horrified by what swiftly became known as the Houndsditch Murders, which followed on from the ‘Tottenham Outrage’ of the previous year when two Latvians had shot dead a constable and a child following an interrupted robbery. One of the Houndsditch gang, George Gardstein, had died of his injuries, having been shot accidentally by a confederate, but a huge manhunt built up to track down all of the gang, a number of whom were arrested before two (neither of whom it is now thought were present at the Houndsditch burglary) were tracked down to 100 Sidney Street, Stepney in London’s East End. The Siege of Sidney Street (or the Battle of Stepney) that was to follow took place 100 years ago on 3 January 1911. It has gained lasting fame for unprecedented scenes that brought armed police and troops onto the streets of London to conduct a siege with desperate revolutionaries, all of which took place before the startled (and undoubtedly thrilled) eyes of the public and the press. 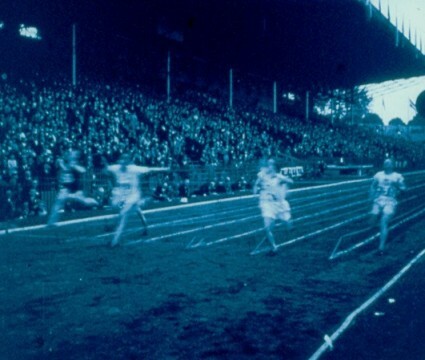 Among those recording the events as they happened were five film companies, and it is their story that forms the reason for this centenary post. The besieged Latvians were Fritz Svaars and William Sokoloff, known as Joseph. They had taken refuge at 100 Sidney Street only for their position to be given away by an informer late in the evening of New Year’s Day. Detectives were sent under cover of darkness to watch over the building while they tried to determine the two men’s movements by contact with a lodger and the informant. Keen not to have the men slip out their grasp, but knowing they would be armed, the police felt they had to act. In the early hours of Tuesday 3 January, armed police were positioned in houses and shops surrounding the block in which contained 100 Sidney Street. By 3.00am there were 200 policemen in place. It was realised that storming the building by its staircase would be foolhardy as the two men would have the advantage by firing down on the police officers, so the adjacent buildings were cleared of other people and the police waited for daylight. As dawn broke, people started to gather around the police cordon, trying to find out what was happening. The police threw stones at the second-floor window where they believed the two men were hiding. Nothing happened. Then someone threw a brick and smashed a window pane. From the floor below shots fired out and a policeman was hit. A hail of bullets followed as they tried to move the wounded man. The two men were well-armed (they were better munitioned than the police, certainly) and well-positioned. An order was sent to bring in troops from the Tower of London. Scots Guards were sent, on the authority of the Home Secretary, Winston Churchill, who thought upon hearing the news that it would be not interesting if he were to go along and see things for himself. By this time the press had got wind of the story, and reporters, photographers and newsreel cameramen were arriving on the scene. Five film companies were present: Pathé, Gaumont, Andrews Pictures, Co-operative and the Warwick Trading Company. Pathé (Pathé’s Animated Gazette), Gaumont (Gaumont Graphic) and Warwick (Warwick Bioscope Chronicle) had each recently established a newsreels and were companies with well-established newsfilm credentials. Co-operative specialised in Shakespeare productions, so it is something or a surprise to see them involved, while Andrews Pictures was a small-scale film renter and exhibitor. Presumably any firm who got wind of what was happening and had a camera operator at the ready made the most of the opportunity. Three of the five films taken that day survive: those of Pathé, Gaumont and Andrews. The troops assumed positions around the building and began firing (it was by now around 11.00am). The barrage of fire from both sides was relentless and was to continue for around two hours. The crowds around the perimeter were now considerable, and policemen had a difficult time holding them back, as the newsreel films make clear. The films showed the heaving crowds, the troops getting into position, policemen armed with rifles, and gunfire coming from the buildings either side of Sidney Street. The Home Secretary had not been able to get the better of his curiosity. He arrived by car at midday and positioned himself at the corner of Sidney Street and Lindley Street, peering round to see what was happening. It was an extraordinarily foolhardy action, one which would soon lead to much criticism (and regret on Churchill’s part) but at the time the idea went round that he was directing operations. Pathé’s cameraman gained a huge scoop by obtaining close shots of Churchill (though the story that film was taken of a bullet going through his top hat is quite false). 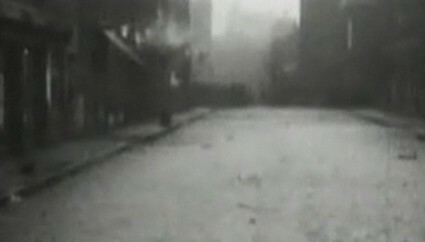 It seems that no other newsreel filmed him – Gaumont certainly did not, as they were positioned on the other side of the street, while Andrews resorted to deceit, declaring that its footage of men looking down at the siege included a rear view shot of Churchill (Churchill did not take up any rooftop position). Then 100 Sidney Street caught fire. The gunfire ceased momentarily as wisps and plumes of smoke started to pour out of the building, which is vividly shown in the film record. Flames could seen from the windows, then the shooting started up again – not just from the soldiers because, extraordinarily, the men inside were still returning fire. Joseph may have been shot dead at this time (the fire started around 1.00pm), while Fritz Svaars died in the flames when the roof caved in and part of the first floor collapsed. Soldiers fired further volleys, then ceased. No one had escaped from the building and it was clear no one could have survived such an inferno. Fire engines arrived and poured water on the charred remains. As firemen entered the building, part of a wall collapsed and one of them died of his injuries – the third and final death caused by the siege of Sidney Street. 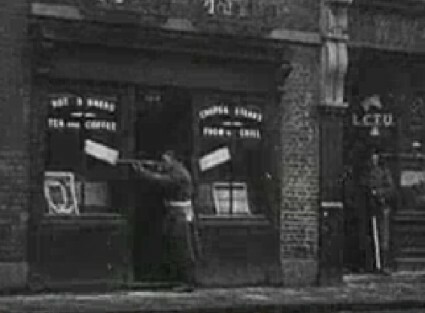 The bodies of Fritz Svaars and Joseph were discovered inside, the second only as late as 8.00pm, by which time the newsreel films had been processed, printed and were on show in some London cinemas, scooping much of the press. In the manner of newsreels at this time, the films let the pictures do the talking. Intertitles on the extant films are matter-of-fact and offer little in the way of explanation, though they do employ loaded terms such as ‘assassins’, ‘murderers’ ‘aliens’ and ‘outrage’. The sensational nature of the films was all that was needed. Detailed description and background speculation was for the newspapers; the newsreels had simply to show audiences what the event looked like, to present the moving pictures of what everyone was talking about. The audience themselves would supply the rest. These were the Houndsditch Murderers, or at least their associates, and most of the public would not have been greatly interested in their affiliations and what drove them to such desperate actions. Their war was not with the British authorities per se, but rather with Tsarist Russia. They (and there were a dozen or so associated with Houndsditch and Sidney Street) were refugees in Britain, which they used as a base for fund-raising and plotting revolution back in Russia. They had strong ideological motivation, and would have been contemptuous of the British police and army as tools of the oppressors. For the popular press they were all anarchists, but most had Social Revolutionary or Marxist affiliations, and had fought in terrible encounters with Tsarist forces, some of them undergoing savage beatings and torture. They believed they would receive similar brutality from the British police should they be caught, which helps explain some of their actions (Fritz Svaars in particular feared that he would break under torture after beatings he had received in Riga a year before). They used robbery to raise funds to support themselves and associates at home, and in some cases for gun-running or the production of propagandist literature. Most were Jewish, and were part of the wave of refugees driven out of Russia by the pogroms of the late 1800s and the savage reprisals that followed the failed 1905 revolution. Britain had a reputation as a haven for such refugees, though most ended up in the sweatshops of the East End, desperately poor and roundly despised by the rest of society as ‘aliens’. British film contributed to this climate of hostility. 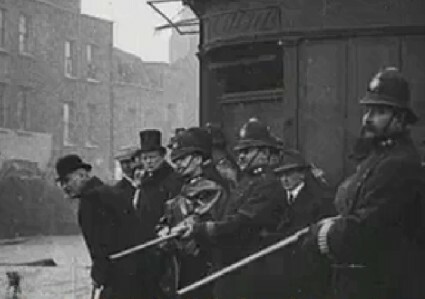 Hepworth produced The Aliens’ Invasion (1905), in which English workmen were shown being thrown out of work because of Jewish immigrants accepting low wages; the Precision Film Company produced Anarchy in England (1909), which recreated the Tottenham Outrage; while Clarendon made The Invaders (1909) in which armed foreign spies occupy a British house disguised as Jewish tailors. However, most often films portrayed anarchists as figures of fun, as in Walturdaw’s The Anarchist and his Dog (1908) – he throws his bomb, but the dog retrieves it. The siege of Sidney Street itself was not dramatised at the time, but the basic details contribute to the climactic scenes of Alfred Hitchcock’s The Man Who Knew Too Much (1934) and a close recreation was attempted in Hammer’s The Siege of Sidney Street (1960). The causes that drove the revolutionaries of 1911 have faded into history, even if terrorism on British shores inspired by overseas conflict and a different set of beliefs has not. But the films remain, and the press reports, and the photographs, and the many picture postcards that were produced, as tragedy was turned into commerce. The films not only show extraordinarily exciting things happening on the streets of London, but they show us an area of London never before visited by the motion picture camera. The wretched, run-down area of Stepney of 1911 would not have attracted cameras in the normal course of events, but humble Sidney Street, its environs and inhabitants gain some sort of fleeting immortality each time we run the films again, before disappearing back into history as the cameras once more turn to focus elsewhere. 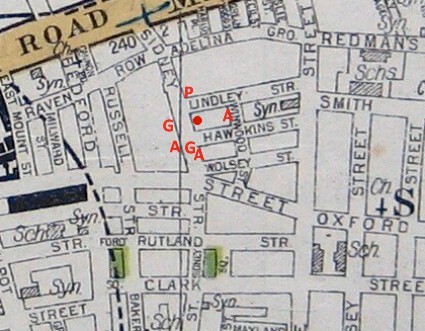 Map of the Sidney Street area showing the besieged building (marked with red dot) and main camera positions of Andrews (A), Gaumont (G) and Pathé (P). Map from http://www.jewisheastend.com. 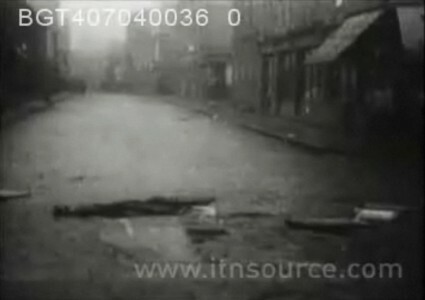 Copies held by the BFI National Archive and ITN Source. The version on the ITN Source begins with the Gaumont film then at 2.43 turns into the Andrews film (see below). 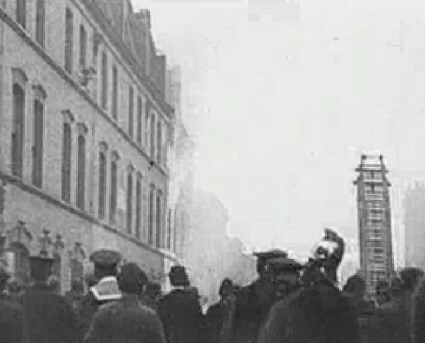 The film shows crowds and police to the south end of Sidney Street, police pushing back the crowds, views of either side of Sidney Street with smoke from gunfire, police holding back crowds with difficulty, view of the building on fire from rooftop of building opposite. The Gaumont intertitles on the ITN copy read: [No main title] … “The police pushing back the crowd at the commencement of the firing” … “The fire – and after”. For further information on the Sidney Street siege, there is one essential source. Donald Rumbelow’s The Houndsditch Murders and the Siege of Sidney Street (1973, revised 1988) is the classic account, outstanding in the dramatic detail and in its understanding of both police procedure and the revolutionaries’ motivations. The Metropolitan Police Service has a short history of the siege from its point of view on its website. For an anarchist viewpoint, try www.siegememory.net, an interactive documentary on the siege currently in development (do check out the video trailer which claims that the mysterious ‘Peter the Painter’ – one of the ‘anarchist’ gang – is an ancestor of David Beckham). The Museum of London Docklands currently has a small exhibition showing artefacts from the siege, examples of which can be view here. The exhibition runs until April 2011. The Independent has another image gallery, using exhibition artefacts and pictures from Donald Rumbelow’s collection. Here is the link to that Pathé’s Animated Gazette item on the funeral of the policemen killed in the Houndsditch incident – it’s very brief but shows a high profile and expensive funeral. Thanks Bryony. I’m so glad it exists, because when I produced a Sidney Street siege filmography at the BFI in 1995 I couldn’t find the film (i.e. on the Technical Record). I didn’t find it on the BFI filmographic database this time around because of the separate of H and OUNDSDITCH in the title – perhaps this could be corrected?